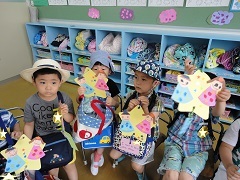 Today’s Class 1 was very active and fun. 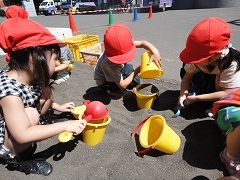 We started the day by going outside and playing in the sandbox with Class 2. We checked our tomato plants as well. After that, we had exercise and Nature Discovery with the other Junior children. We learned where tomatoes grow on the plants and what color they turn before we can eat them. 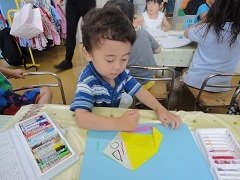 Then, we finished coloring the backgrounds for our origami fish. The fish all looked so happy with cute faces and friends colored on. We had a lot of summer fun and everyone went home happy!